Alev Lytle Croutier's "Harem: The World Behind the Veil (25th Anniversary Edition)"
Had I not read Alev Lytle Croutier's Harem: The World Behind the Veil when it was first published 25 years ago, I would have continued thinking that a harem in Turkey was basically a gathering of women sequestered--imprisoned--for the deviant sexual pleasure of the pasha, sultan or whomever else was in charge. Like that of most other people in the west, my understanding of the harem was a salacious one, and very inaccurate. Croutier's book was therefore a revelation, and in its re-publication in a new edition this year, it remains one. Photo courtesy of Alev Lytle Croutier. Used with permission. I learned once more in the preface that Croutier's paternal grandmother and that woman's sisters had actually been members of a harem: "Which really means a separate part of a house where women lived in isolation, having no contact with men other than their blood relatives. The term does not necessarily imply the practice of polygamy." Those sentences begin Croutier's sophisticated and fascinating education of the reader about what a harem actually was for her grandmother as well as for countless other women, at various levels of Turkish society, over the previous centuries. We learn about the Grand Harem of the sultan, and what activities the women could engage in...the poetry of the harem, the shadow puppets plays they mounted, the secrets of flowers and birds, the riddles they shared, the stories they told, their outings, games, and many other activities. "Women of the harem were renowned for their luminous complexions and satin skin," Croutier writes, and therewith begins a tour of the grand harem baths. "To wash and purify oneself was a religious obligation. This may perhaps explain the existence of so many baths in the Seraglio. The sultan, the Valide, and the wives all had private baths, while the other women of the harem shared a large bathhouse, which sometimes welcomed the sultan as well--the stuff of Orientalist fantasy...For harem women, deprived of so many freedoms, the hamam (i.e. Turkish bath) became an all-consuming passion and a most luxurious pastime." We learn every detail about the baths: the water used, the henna floral designs for special occasions, perspiration preventatives, the powders, the brushes, the spices, the depilatory called ada, which was a paste made of sugar and lemon (for which Croutier provides the recipe and the method for using the concoction)...everything. We also learn who the sultanas were, the princesses and the relationships between them all, the organization of the harem, the social relationships between the various levels of harem hierarchy, pregnancy and accouchement within the harem, and the handling of childbirth. The Grand Harem in the Topkapi Palace was one thing, in which many, many women lived in luxurious surroundings. These were the kinds of harems so much written about by western commentators, whose descriptions Croutier uses very often and quite colorfully. But one of the most interesting chapters in the book for me (because it was the least expected) is titled "Ordinary Harems". A Turkish Muslim man of modest means could still marry four women legally, and they were his harem. The situation for these women was far more workaday and closely familial than for those in the royal seraglio, and Croutier's description of the customs involved are very special...and even personal. "Romance or not, families decided who married whom. My grandmother was promised to her father's best friend when she was merely a child. When they eventually got married, she was fourteen and my grandfather was forty." In this chapter, we see how a proper husband should treat his wives (for example, "Good husbands were diplomatic. They abided by the Qur'an and gave the impression of treating all their women equally...The husband alternated nights in the bedrooms, spending Friday nights exclusively with their first wives."). She describes what the relationships among the wives could be like, what was required for household upkeep, the treatment of odalisques (i.e. house servants), and even the various preparations of the bodies of deceased wives for burial. This chapter on ordinary harems was unusual for me because I had not realized that a harem was a reality in almost every level of the society that Croutier describes, and not intended solely for the sultan and others of the upper-class. The chapter is a view of everyday life in this society that may have gone unnoticed by western readers had it not been for Croutier's study of it. John Singer Sargent, Fumée d'Ambre Gris, 1880, oil on canvas, Sterling and Francine Clark Art Institute, Williamstown, Massachusetts. Used with permission. Harem is quite lavishly illustrated with photos of various harem women (including some from Croutier's own family in Turkey). Many of the illustrations come from Turkish artists of the historical period being covered, and there is as well a number of breath-taking paintings done by such Europeans as Eugéne Delacrox, Leon Bakst, Jean-Auguste-Dominique Ingres and others, all influenced by the popular European Orientalist movements of the period. 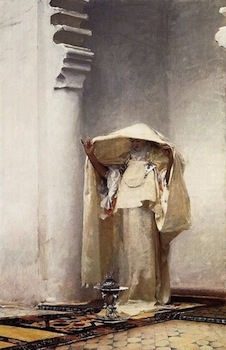 I first saw one of my very favorite paintings in this book: John Singer Sargent's Fumée d'Ambre Gris, in which an extraordinary woman, in contemplation of the essential perfume of amber coming up to her from a harem censer, is lost in lush, joyful contemplation. The setting--an alcove in some corner of a harem chamber--is severe, of bone-like white, while the carpets, the glorious censer, the woman's clothing and jewelry and, especially, her hands and face, exude the sensitivity of private, sensuous dreaming. "The Internet has created a dynamic exchange in which a Moslem woman can be a traditionalist or an iconoclast, a housewife or an entrepreneur. The neutral ground of cyberspace allows women to learn about their rights within the religion, without the usual cultural or traditional barriers." This is all to the good, of course, and turning back is not an option. But Croutier herself misses one aspect of the old way. 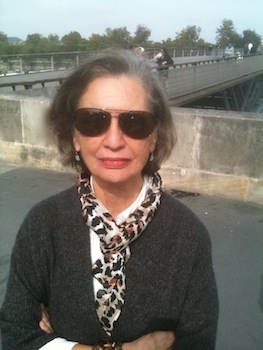 "It never ceases to amaze me," she recently wrote, "that all my research for this book was done without the Internet. Those old fashioned forms of research--long hours in the library, the manuscripts, the dust and bookish enjoyment of the search for knowledge--certainly had more of a romantic edge for me." The idea of a harem has always been of interest to the west, although the truth of the harem is often sacrificed to over-wrought sensualist fantasy. The reality of the harem, as presented in this fine book, brings the idea to lovely--and accurate--fruition. Terence Clarke is the director of publishing of Astor & Lenox. His new novel The Notorious Dream of Jesús Lázaro will be published in early 2015.